Sprinkle the yeast over the warm water in a small bowl. The water should be no more than 100 degrees F (40 degrees C). Let stand for 5 minutes until the yeast softens and begins to form a creamy foam. In a large bowl, mix the warm milk, sugar, and salt, and mix to dissolve. Pour the yeast mixture into the milk mixture, and stir to combine. Beat in the butter, eggs, and flour until the mixture forms a smooth, soft dough. Cover the bowl, and let rise until doubled in bulk, about 30 minutes. Stir the dough well, cover, and let rise 30 more minutes. Mix honey and 1/2 cup of water in a saucepan, and bring to a boil over medium-high heat. Turn off the heat and let the honey syrup cool. Heat oil in a deep-fryer or large saucepan to 350 degrees F (175 degrees C). Oil should be about 2 inches deep. Place a large table or soup spoon in a glass of water near the batter. Scoop up about 2 tablespoons of dough per puff with the wet spoon, drop it into the wet palm of your hand, and roll it back into the spoon to create a round shape. Do not overhandle the puffy, soft dough. Drop the dough balls into the hot oil in batches, wetting the spoon each time you make a dough ball. Fry in the hot oil until golden brown on the bottom, and roll them over to cook the other side, 2 to 3 minutes per batch. Gently set the loukoumades aside to drain on paper towels. 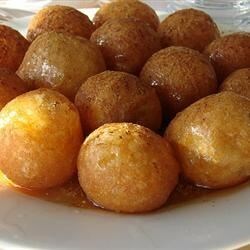 Place the loukoumades on a baking sheet, drizzle them with honey syrup, and sprinkle with cinnamon. Serve warm. See how to make traditional Jewish doughnuts. We used wheat flour because that's all we had, and they came out great. Very delicious. instead of using the honey syrup i used white confertoners sugar a topping.it turned out great.this is defentally something i will make more of. mine weren't perfect circles, but they were delicious. I also mixed the cinnamon right into the honey syrup when it was boiling. Recipe was really good. I just added a teaspoon of vanilla extract to the dough and it had a good flavor.